Another great and busy weekend in our house 🙂 Here is a quick recap. Once again I failed at taking pictures to actually share. Thursday evening we had Megan and her boyfriend Denny over for dinner. Super fun evening. Can’t wait to schedule another dinner with them sometime soon. As mentioned in last weeks meal planning post, I made Oven Chicken Fajitas. Overall, I think the recipe turned out great. Super easy, totally a meal you can prep ahead of time and really tasty. The only thing wrong with it…I think I cooked it a little too long. The chicken was a little dry 😦 Next time I will keep a closer eye on it. Or, I may try it in the crock-pot. On Friday, I was able to leave a little early so the Mr. picked me up from the office and we made a quick Costco run before heading home. We have decided that Friday evenings are the BEST time to go. Way fewer people so you can get in and out pretty quickly (unless you get caught going up and down every aisle like I love to do). After unloading/unpacking and resting for a few minutes, the Mr. and I headed out to meet up with our brother & sister-in-law for dinner and drinks. We had a coupon (surprising I know) to use at Grub. Grub is a relatively new (I think) restaurant on the top of Queen Anne. Overall we enjoyed the meal. Wine pours were good (very important) and the food was pretty tasty. They did run out of a few things so it made the menu a little small (and one of them was an item the Mr. had wanted to order for dinner so that was disappointing). After dinner, we decided to grab a beer at Hilltop Ale House and continue visiting (lots to catch up on as Josh had been gone for the last month). On Saturday morning, the hubby went golfing while I ran a few errands. I then met him and my dad at the club for a quick-lunch. Afterwards, the Mr. and I then headed north for an overnight trip with a group of friends (our game night crew) to my friend Morgan’s family beach home up in Camano Island. It was such a relaxing getaway! We played a few games, had delicious food (way too much of it! ), chatted, took a walk on the beach, etc. Was so nice to get away even if it was only for a night. Sunday evening my friend Brooke hosted an Oscars party. Was good to see her new home and spend time with a few girlfriends I don’t get to see often enough! Last weeks meals were a success. My favorite (and by far the easiest) was the Portobello Mushroom Pizza’s. I for sure need to share that one. Didn’t get to cook the flank steak as we ended up going out. And the Tuna and Farro salad was good but a little dry. I will need to mess with it a little next time to perfect it. Here are this weeks plans. Anyhow, for the family birthday party this past weekend, I was asked to bring an appetizer. Instantly, I knew I had to make these tacos myself and bring them to share with my family. At first I got a few odd looks but once they each took a bite they were all (well most) pleased and really liked them 🙂 I couldn’t make the tacos fast enough. Absolutely no leftovers. 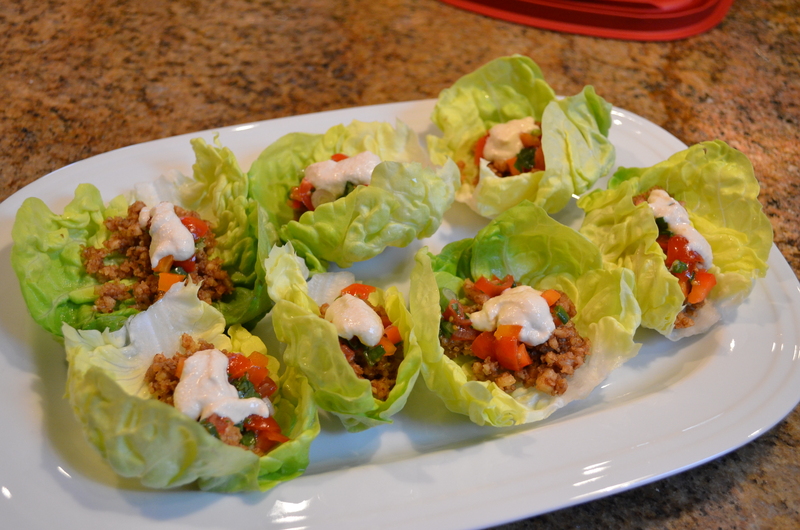 Highly recommend giving these a try if you are looking for an appetizer or a light dinner! Enjoy! Put all ingredients in a food processor and pulse just to mix. Don’t over-blend. 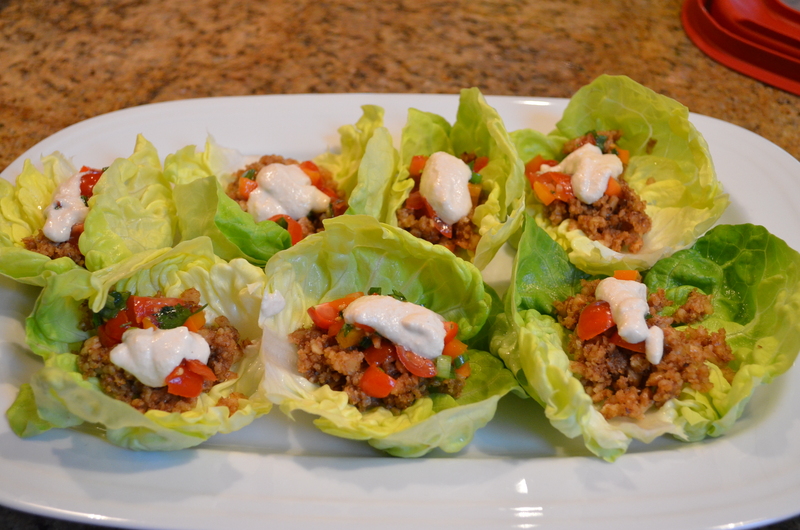 To serve, put a few spoonfuls of the filling on lettuce leaves. Top with Cashew sour cream (recipe below) and your favorite salsa. Put all ingredients except water in a food processor and blend, adding water one tablespoon at a time until the desired consistency is reached. What a nice weekend this last one was. Quick recap: On Friday night, the Mr. and I went up north to my good friends daughters 3rd birthday party. So nice to see her, the family and other friends. After the party, we met up with my parents for a late dinner at one of my favorite restaurants, Brier Pizza. Love that place! Saturday morning,we hung around the house and took Leo to the dog park. Then I met up with my good friends Morgan, Becca and Amanda (and Baby Kate) for lunch and a walk around Greenlake. Always good spending time with my XO ladies. On Saturday evening we just hung around the house. The hubby’s buddy Burger stopped by for a visit and had dinner with us as his wife was hosting a girls dinner 🙂 On Sunday, the Mr. went golfing in the morning, while I hung at the house and ran errands. Then, in the afternoon, we headed over to my aunt and uncle’s house for a wonderful evening with family celebrating 5 birthdays! This week has been absolutely exhausting! Thank goodness it is the weekend! I was good this week and followed through on all the planned meals. Guess as it was only three, it wasn’t hard 🙂 All three recipes were a big success. I absolutely LOVED the BBQ Chicken Chickpea Chopped Salad. It was so easy and so, so, so tasty. Even worked great for lunch the next day! This one is definitely a keeper to use again! Will share this one soon. Too good not too. The crock-pot jambalaya turned out amazing and was perfect for a Saturday night in. It made a ton and will work great for a day or two of lunches! The Mr. highly approved of this one! 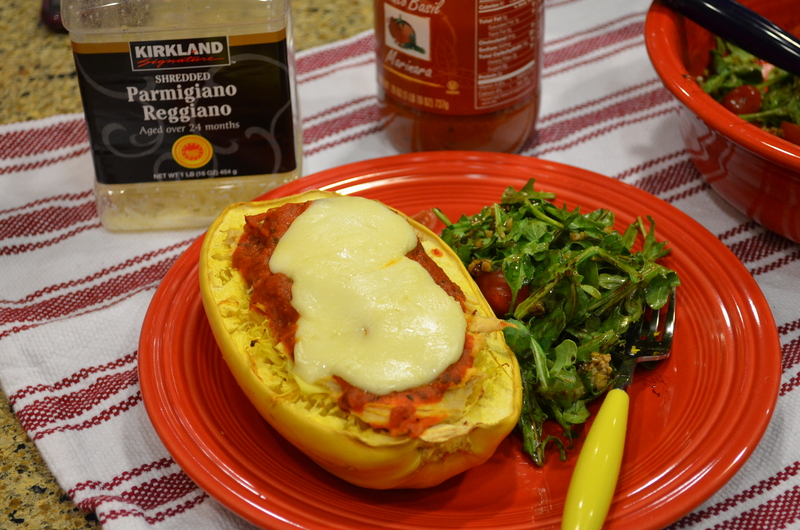 On Thursday night I made the spaghetti squash boats with chicken and they turned out delicious. Both the Mr. and I enjoyed them. They did take a little longer than expected (wonder if my squash wasn’t quite ripe enough) but once we were able to eat them, the wait totally seemed worth it! Based on the ingredients I had, I did change the recipe up a little bit, but overall, I followed it fairly closely. Highly recommend trying this one out! Only changes I would make are: 1) add a little extra marinara sauce, 2) add fresh basil at the end, and 3) not forget to add garlic. Preheat oven to 350°. Cut the squash in half lengthwise, scoop out the seeds and fibers with a spoon. Place on a baking sheet, cut side up and sprinkle with salt and pepper. Roast about an hour to hour and a half. Meanwhile, boil chicken breast for approximately 15 minutes (or until cooked through). Once cooked, shred chicken and set aside. 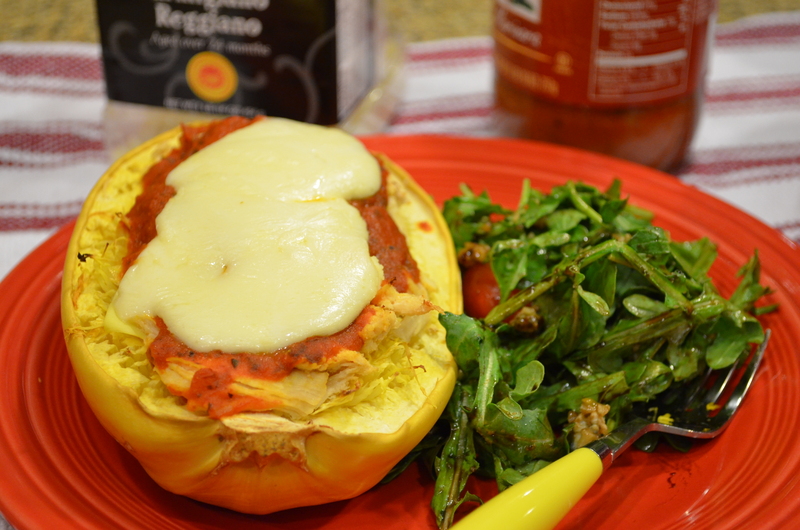 Remove the spaghetti squash from the oven and carefully “fluff” the spaghetti-like strands on each half with a fork, leaving the squash in the shell. Season with salt and pepper. Top each half with the artichoke hearts and ricotta, followed by the shredded chicken. Then spoon about 1/2 cup marinara (with added garlic) in each boat. Lastly, top each with cheese and place back into the oven and cook until the cheese is melted and the sauce is hot, 10-12 minutes. To go with our dinner I made a simple arugula salad. I used about 3 cups arugula (2 good handfuls), a cup of sliced cherry tomatoes, crumbled blue cheese (probably 1/8th of a cup) and 2 tablespoons or so of chopped pecans. 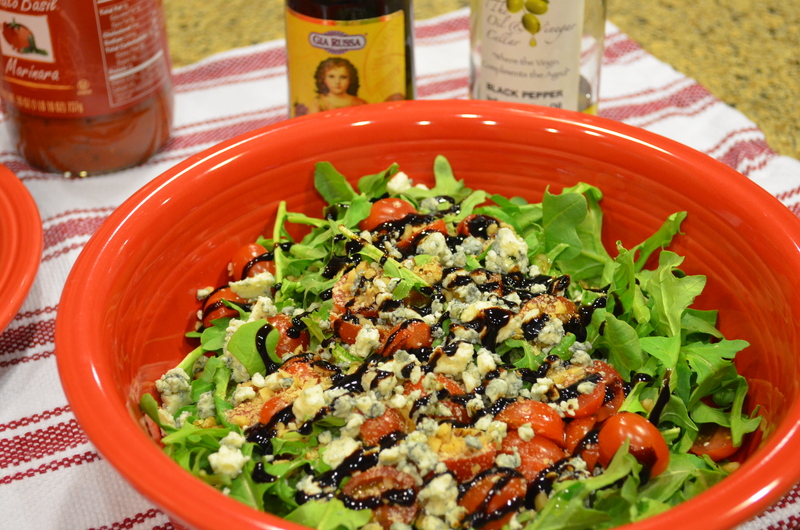 I then added a teaspoon of good olive oil and topped it all by a tablespoon or so of balsamic glaze. Such a simple salad but super tasty! Hope you all have a great your weekend! Here are this weeks meals. Looking forward to them. Been wanting to try these recipes for a while! Tuesday: Out to Tavern Law to Celebrate the hubby’s 31st Birthday! This past weekend the hubby and I spent some quality time together 🙂 We originally were supposed to be in Whistler with family/friends, however, that trip sadly had to get cancelled. Instead, I surprised (well kind of) the Mr. with an overnight trip on Friday to the Salish Lodge in Snoqualmie and then a massage and pedicure on Saturday! The Salish Lodge was awesome. We got there Friday evening and went to one of their restaurants (the Attic) for dinner. Then enjoyed wine and a fire in our room. Saturday morning we were super lazy and enjoyed reading in bed for several hours. Sadly we didn’t get to see the falls as it was SUPER foggy 😦 The Mr. had never had a massage or pedicure so as part of our adventure I booked us both at InSpa in Issaquah (had a few gift certificates from a wedding gift). I think he enjoyed it but not sure he thought it was worth the money! 🙂 Oh well, I will continue to go and enjoy them. Hope everyone had nice weekends! Happy Monday!